specifications may be changed without notice. Danger: Be aware of extremely hazardous or potentially lethal situations. Attention: Be aware of possible damage to programs, devices, or data. Note: Pay attention to this important information. В© Copyright Lenovo 2013. All rights reserved. disclosure is subject to restrictions set forth in Contract No. GS-35F-05925. air vents can cause overheating. connector on the graphics adapter. Attention: Do not open the WiFi antenna cover. line-in connector of the computer. a stereo system or other external recording device. stored on a media card. Connect to the HDMI connector on your display or TV. follow the installation instructions for those devices. Use the following information when connecting your computer. match the color of the cable end with the color of the connector. вЂў If the voltage supply range is 100-127 V AC, set the switch to 115 V.
вЂў If the voltage supply range is 200-240 V AC, set the switch to 230 V.
devices option to setup the sounds in the pop-up dialog box. Configure button to configure it. box to proceed with the speaker setup by following the prompts. connection or a surge protector. Some models are equipped with Power Adapter. Note: Only some models are equipped with Blu-ray optical drive. the requirements of the Blu-ray standard. 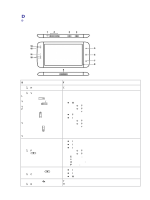 This table will help you to identify the connectors on your computer and display. network that connects your computer to other devices. depending on the manufacturer. Follow the manufacturerвЂ™s instructions. tap Connect, then follow the steps on the screen. Vantage Technology) program, LenovoвЂ™s pre-loaded Home PC software. вЂў Some models are not equipped with the LVT program. turning on the computer until the Lenovo Rescue System opens. вЂў Select the Windows desktop tile on the Start Screen. вЂў Select Start from the Charms Bar. thumbnail when it is displayed. Charms provide new and faster ways to perform many basic tasks. вЂў Move the cursor to the top right or bottom right corner of the screen. 2. Select Power в†’ Shutdown. appears, drag it to the bottom of the screen. hand, drag the app page to the bottom of the screen. There is a fast way to open other system programs. appears, right-click with the mouse to open the menu. вЂў Select the Settings charm, then select Help. install the operating system on the C: partition. partition, which must not be deleted. not be liable for any losses arising therefrom in any way. computer to the system default or to a previously backed up state. the Lenovo Rescue System opens, then select OneKey Recovery. Next to start the restore. operation during the recovery process. restart the computer. Restart the computer and start the operating system. that were shipped with your Lenovo hardware. Lenovo Rescue System opens, then select Drivers and Application Installation. OK to start installing the Lenovo Drivers and Application Installation software. installation process will continue until it has completed. 1. Do not install software which is already installed on the computer. of your computer, and explore help and support information. Click the Lenovo Support icon from the Start Screen or Search Screen. topics. Take advantage of award-winning Lenovo services. 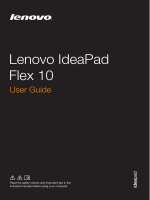 The User Guide provides more information about your computer. provides flexible options to meet your personal or business needs. installation procedures to ensure that the part is correctly installed. вЂў If an error message appears on the screen, write down the exact message. This message may help support personnel diagnose and fix the problem(s). Problem: Blank screen or no image is displayed on the monitor. 1. Check to see if the monitor has been turned on; if not, press the Power button. Problem: You need to change the display property settings. resolution from the pop-up menu to change the appearance. 2. Move any interfering devices away from the computer. 3. If the problem persists, contact Lenovo Service. Problem: No sound from the integrated speakers. вЂў Reinstall the audio driver. Problem: No sound from headphones. securely inserted into the headphone connector. turned up and the sound is not muted. Problem: You are unable to exit a running program normally. Manager option from the pop-up dialog box. 2. Select the problem program, then click the End Task button. Problem: You need to install or uninstall a program. harmful to the operating system, and might cause a system-wide malfunction. 2. If the program has its own uninstaller, run it directly to uninstall the program. Panel from the Search charm. 4. From the Control Panel, choose Programs в†’ Programs and Features. 6. Perform the instructions displayed to uninstall the software. Problem: The Optical drive is unable to read a CD/DVD. the CD or DVD. Otherwise, continue with the next step of this procedure. optical drive is capable of reading this type of CD or DVD. one that was shipped with the computer. hard disk space. This may account for the apparent hard disk capacity deficit. capacity 1G is 1000M, while the actual capacity 1G is 1024M). should be: 40 x 1000 x 1000 x 1000/(1024 x 1024 x 1024) = 37G. different from the actual capacity due to the rounding of totals. The drivers for this computer model only support the Windows 8.1 system. What is the BIOS setup utility? How can I start the BIOS setup utility? How can I change the boot mode? or Legacy support on the boot menu. When do I need to change the boot mode? Windows operating system cannot be installed if you donвЂ™t change the boot mode. 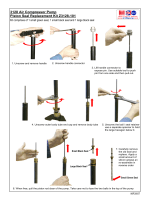 for cleaning displays, and follow the instructions included with the product. monitor, the printer, the speakers and the mouse. вЂў You can use a vacuum cleaner to clean in otherwise inaccessible corners. with a wet cloth. Do not use the keyboard until it is dry. вЂў Allow water to enter the computer. вЂў Use a heavily dampened cloth. вЂў Spray water directly onto the surface of the monitor or inside the computer. monitor and keyboard every day. Keep all surfaces clean and free of grease stains. Manual (HMM) for parts ordering information. personnel without the need for step-by-step procedures. Note: Use only parts provided by Lenovoв„ў. a TV card. It does not apply to machines which do not have a TV card. can obtain one online from the Support Web site at http://support.lenovo.com. available from the World Wide Web. To access this information, go to http://support.lenovo.com. components to avoid a mismatch when replacing the components. ready to install the new part. edges. Never touch any exposed circuitry. вЂў Prevent others from touching the parts and other computer components. surface and place the part on it. вЂў Do not place the part on the computer cover or other metal surface. devices that are factory-installed or that you can install later. The following illustrations show the locations of parts on the system board. Note: Use only parts provided by Lenovo. cool down before removing the cover. the operating system, and turn off the computer and all attached devices. 2. Unplug all power cords from electrical outlets. computer. Refer to вЂњLocating connectors on the rear of the computerвЂќ. 5. Slide the computer cover to the rear of the chassis to remove it. Note: For this procedure, it helps to lay the computer on its side. 1. Remove the computer cover. Refer to вЂњRemoving the computer coverвЂќ. and pushing the bezel outward as shown. 4. Refer to вЂњCompleting the installationвЂќ. 2. Locate the memory module connectors. Refer to вЂњLocating componentsвЂќ. 5. Refer to вЂњCompleting the installationвЂќ. 2. Disconnect the data and power cables from the hard disk drive. 3. Remove the four screws that secure the hard disk drive to drive bay. 4. Remove the hard disk drive by pulling it straight out of the drive bay. 5. Slide the new hard disk drive into the drive bay. 6. Secure the new hard disk drive to the drive bay with the four screws. parts on the system boardвЂќ. 8. Refer to вЂњCompleting the installationвЂќ. 2. Remove the front bezel. Refer to вЂњRemoving and replacing the front bezelвЂќ. 3. Disconnect the data and power cables from the rear of the optical drive. 4. Remove the two screws that secure the optical drive to drive bay. 5. Push the optical drive straight out of the front of the chassis. 7. Secure the optical drive to the bay with the two screws. 8. Connect the data and power cables to the drive. 9. Install the front bezel. Refer to вЂњRemoving and replacing the front bezelвЂќ. 10.Refer to вЂњCompleting the installationвЂќ. 3. Disconnect the card reader data cable from the connector on the motherboard. 4. Remove the screw that secures the card reader module to the chassis. 5. Slide out the card reader module as show. then slide it into position. 7. Secure the new card reader module to the chassis with the screw. 8. Install the front bezel. Refer to вЂњRemoving and replacing the front bezelвЂќ. 9. Refer to вЂњCompleting the installationвЂќ. 3. Install the new adapter into the same adapter connector. 4. Ensure the adapter is fully seated into the adapter connector. 5. Screw the latch into the chassis. 6. Refer to вЂњCompleting the installationвЂќ. rear of the computerвЂќ and вЂњLocating connectors on the front of the computerвЂќ. or at the rear of the computer. keyboard cable to the same connector. * The mouse can be replaced using the same method. Setup UtilityвЂќ in the Hardware Maintenance Manual. for the location of the various components. closed until it snaps into position. Screw back the two screws on the chassis. on the rear of the computerвЂќ. a few days after the CRU arrives. Thank you for using Lenovo products. prior written permission of Lenovo. Lenovo in the United States, other countries, or both. Intel Inside is a trademark of Intel Corporation in the U.S. and/or other countries. publications may be trademarks or service marks of others. environment through energy efficient products and practices. By using ENERGY STAR compliant products and taking advantage of the powermanagement features of your computer, you reduce the consumption of electricity. environment, and the reduction of greenhouse gas emissions. For more information about ENERGY STAR, go to: http://www.energystar.gov. ENERGY STAR power-management features, by operating system. Windows Help and Support information system. electricity consumption when your computer is in standby mode or turned off. 3. Select Enabled and press Enter. computer by pressing the power switch.